Jhon loves the trails and is willing to ride all day. Easily does three hour trail rides. Loves to go but easily stops when asked. She crosses water, ties to trailer, loads easily, stands for the farrier, loves to be groomed and is just a really good horse. he is a curious in your pocket horse with lots of personality. Just go in the pasture with your tools and he becomes your handy helper. 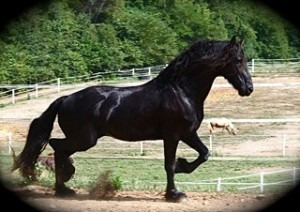 Former show horse purchased directly from original breeder. I am only adopting because I no longer ride. he just came back from trail riding trainers where I sent him to get him back in riding shape. Easy keeper. Wonderful and playful personality.